Last week, I traveled to north-central Sweden to compete in the second annual UltraVasan 90K on Saturday morning, August 22. What follows is an account of my race but also the race history, the course, and the three kings on everyone’s mind as the weekend unfolded. There is a man whose name looms large in Swedish heritage, but particularly in the town of Mora, Sweden and in the cross-country skiing world. This is Gustav Vasa, the first king of Sweden, who defeated King Christian II, a Dane who ruled over the Kalmar Union (which consisted mostly of modern day Scandinavia) in the early 16th century. The Swedish nobility had grown increasingly frustrated by Christian II’s rule, leading to a number of Swedish uprisings; Vasa was among those rebelling. In 1520, Gustav Vasa’s father and nearly 100 others were executed in the Stockholm Bloodbath even though the rebels had been promised amnesty. Fearing for his life, Vasa fled north to Dalarna—the region now famous for the Swedish Dala Horses—attempting in Mora to raise an army from amongst the tough, independent-minded northerners. Failing to do so, he fled on skis towards the mountains to the west. Shortly after Vasa fled Mora, the Dalarna people changed their minds and decided they would fight for Vasa. They sent their two best skiers to chase down Vasa and bring him back to Mora. The skiers caught Vasa in the town of Sälen, and the three returned to Mora to rally the people and fight the Danish king. After several years, the Swedes finally defeated Christian II, and Vasa was elected King Gustav I. While Vasa’s subsequent record as a king was spotty, his flight from and return to Mora became a legend, and he is credited as the founder of modern Sweden. In summer, the Vasaloppet route is a popular and beautiful hiking path, winding through forested hills speckled with lakes, the lakes speckled with islands. Low mountains feature on the west end of the route, rising from Sälen to the Norwegian border about 30 kilometers away. Crossing spongy moorlands and prime habitat for moose, wolves, and bears, the often-foggy path includes many lengthy, narrow footbridges. As the nature reserve trail nears the town of Mora, the single-track yields to mostly double-track dirt and grass paths, traversing pastures and less-dense forest. Even as the route comes into town, it snakes along a river and through parks and camping areas before following a final kilometer through town on pavement to the Vasaloppet finishing arch. In 2009, the Vasaloppet organization began staging a mountain biking race in summer called the CykelVasan, which has quickly gained popularity among the active and sporty locals. In 2014, the race organization added running to its purview: the UltraVasan 90K, the UltraVasan 45K, and the 10-person Vasastafetten (90k relay). 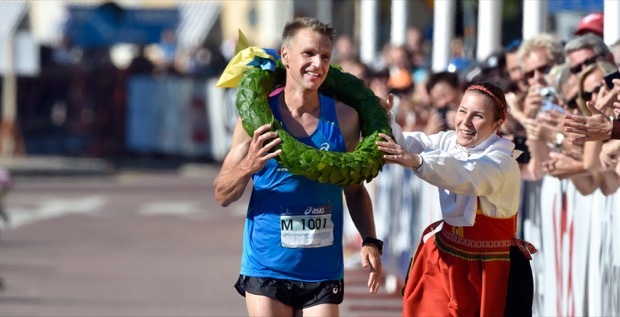 The UltraVasan 90K is directed by Peter Fredricsson, a Mora resident and the coach of the Swedish 100K World Championships team. Fredricsson and Jonas Buud, the undisputed king of Swedish ultrarunning, came up with the idea of having a running race along the Vasaloppet course. Like Fredricsson, Buud lives in Mora, a charming town of about 10,000, filled with outdoor enthusiasts. As with Leadville or Auburn in U.S. ultrarunning culture, Mora is obviously and inextricably linked to its races. Locals all seem to race the events or volunteer for them, earning money for the local youth sports club for each hour they work. (Despite its size, the race is owned by the local youth sports clubs, so race profits go directly into building an active, athletic culture.) With nearly a century of organizational experience and a Swedish work ethic, the race is extraordinarily well run. Examples of this abound: the permanent structures that house primary aid stations every 9-15k; secondary aid stations with water and sports drink roughly every 5k; markers at every kilometer displaying both the number of kilometers to the next aid station and to the race finish; a detailed map and profile of the course printed upside down on the race bib so that a runner can simply look down to access this information; timely press conferences, technical meetings, prize-giving, and results and recaps including a well-produced video summary of the race. The UltraVasan is, in a word, professional. That Sweden’s top professional runner, the local who trains daily on the course, should be king here is fitting. Jonas Buud’s record is lengthy and impressive. He has finished 2nd and 4th at the Comrades Marathon, 2nd at the 100K World Championships (four times! ), 2nd at the Ultra Trail du Mont Blanc, and won the Swiss Alpine Marathon a stunning eight times. The challenger in last year’s inaugural UltraVasan 90K was Britain’s top gun, Steve Way, a master’s runner like Buud, yet very much in his prime. Last year, Way ran a 6:19:20 100k and a 2:15:16 marathon, both personal bests. At UltraVasan 2014, Sweden’s Elov Olsson, chasing a spurtpris (or mid-race prime), pushed the pace early. Way took over through half way, but on Buud’s home turf, Way fell behind shortly thereafter. Buud pressed on to finish with a remarkable 6:02:03 (or 6:28/mile pace) on a trail course with nearly 900 meters (or 3,000 feet) of vertical gain. Holly Rush, another British ultrarunner set the women’s mark at 7:09:04 last year, though she was unable to return to defend her title and course record this year. This year’s UltraVasan drama began to unfold last November in Doha, Qatar at the 2014 100K World Championships. Buud was fit and taking aim at his first victory while America’s Max King was making his 100k debut. In hot and humid conditions on a mentally grueling loop course, King pulled away from the field over the final 30k in Doha to secure a win and American Record 6:27:43, but not before Buud began to close on him, hard. Buud ultimately ran out of real estate, but the glimpse that King caught of the chasing Buud on the final loop pushed him to his fastest few kilometers of the race. If there were anyone who could push Buud at the 2015 UltraVasan, it would be Max King, a 2:14 marathoner and master of many running disciplines. Buud was in supreme form as this year’s race approached, despite suffering a stress fracture in his hip earlier this year. He had broken records in several local races that he had raced many times before, and once again he was training specifically on the race route. King on the other hand has had an up-and-down year, but he is always a force to be reckoned with. Remarkably, as this year’s race began in the pre-dawn mist of Sälen, the pace was even quicker than last year and there were 10 men in the lead group. I was in this pack, somewhat to my surprise. With less than three months of running under my belt after a six-month injury layoff, I thought a conservative approach most prudent. But racing instincts die hard and the pace was not unduly uncomfortable as we climbed a logging road to the first aid station. However, on the most technical section of the course that followed, Buud slowly wound it up as we descended rocky, rooted single-track. The pack of (now) eight bunched behind him, awaiting the first spurtpris. When we hit the final 1k open road to the spurtpris, I took off, chased by Norwegian Didrik Hermansen. I had to work hard to hold him off, running sub-5 minute mile pace for close to a half mile. This wasn’t optimal for my overall race finish of course, but uncertain how I would fare over 90K when not in top form, I opted for a bird—or Swedish krona in this case—in the hand versus two in the bush. My move served to break open the race a bit, essentially the purpose of the primes, which are gradually becoming more prevalent in ultrarunning. I watched a lead pack of four slowly pull away, including Buud and King. King, like me, couldn’t resist chasing the next mid-race spurtpris. He gapped Buud by a couple minutes on the uphill to Evertsberg to pocket the prize. As with Steven Way last year, this played directly into Buud’s hands. Knowing Max would be tired from his push, Buud made a move of his own on the long, fast descent out of Evertsberg, managing to run a reported 21-minute split for a 6k stretch (or 5:38/mile!). Buud was untouchable the rest of the race and bested his own course record by an astonishing 21 minutes, finishing in 5:45:08. This is 6:10/mile for 56 miles of trail running. For additional perspective, if Buud maintained pace for another 10k, he would have broken King’s 100k American Record by 4 minutes. He also must have split a 5:06 50-mile en route (if not faster). It was likely the best race of his career. King faltered some, but managed to hold off Hermansen by a few minutes, 6:06:11 to 6:08:10. Meanwhile, the chase packs were splintering in the leaders’ wake. The 2nd through 9th place men would shuffle positions but ultimately finish with a mere 7 minute, 13 second spread. Paying for both my earlier spurtpris choice and a general lack of fitness, I fell as far back as 10th place before rallying in the final 20k to finish 7th. The women’s field lacked the depth of the men’s field, but the race still featured several strong runners and also saw a new course record. Switzerland’s Jasmin Nunige, a former Olympian in cross-country skiing, ran strong and built a large lead before struggling in the race’s final stages. She overcame a hard-charging Ida Nilsson to win in 7:02:35. Nilsson, in her ultrarunning debut, also bested Holly Rush’s old record with a 7:05:56. Petra Kindlund rounded out the women’s podium with a 7:34:02. The race was by all measures a success in its second year, and saw nearly 7,000 starters including the relay. As with the skiing and mountain biking events, the organizers intend to grow the race through more events—perhaps an UltraVasan 30K or even shorter races and youth races—plus increasing the size of the marquee events. They want to host championships and be part of high-level race series. Fredricsson, the race director, talks about building something akin to the Comrades Marathon for trail running (Comrades is the largest and most competitive ultramarathon in the world). While the UltraVasan course lacks the sexiness of the current en vogue mountain and Skyraces, that can be a great thing, especially for a race with UltraVasan’s ambitions. Fredricsson speaks of the accessibility of the course, its unique heritage, and the high-level competition as drivers for growth. The reality of mountainous races at high altitudes is that only a small segment of the population can properly train for and compete in them. (That doesn’t mean they’re not cool or fun of course!) In the U.S. and in Europe, the vast majority of trail runners do not live in the mountains. Indeed, some countries don’t have mountains at all. But everyone has trails.